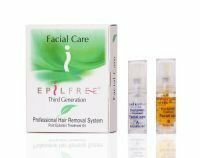 The FACIAL CARE serums is designed for the fragile skin of the face. The packaging itself makes use on the face comfortable. Instead of a spray bottle, the activator in the FACIAL CARE kit has a small pump. The activator is prepared with its own serum viscosity that is designed to spread the serum on the treatment area instead of spraying. A very small amount of the activator is needed which is patted gently onto the skin. By the end of five minutes, the activator will gently open the hair follicle four times its normal size. Part B, is our toner. We use a delicate alcohol – SD alcohol 40 instead isopropyl alcohol to avoid irritation since the skin on the face is thinner and more delicate. This is the serum that kills the hair follicles that were waxed while in the Anagen Phase. This action is permanent.